Up for sale we have a 1967 Ford Mustang Convertible. This car has been freshened up with a lot of new trim and stainless and has had the paint and interior redone. The body all appears to be rock solid and has good fit of all the panels. It's covered in the Lime Gold paint scheme that looks great in the jams and is accented by the White Top. The paint has been buffed and polished to a beautiful finish. When restored, new bumpers were installed. Also, the emblems, bezels, grill, handles and other chrome and stainless is either new or in great condition. All the glass is in great condition as well with the vent windows having been changed. New windshield seals and window felts have also been installed. To finish off the look it's sitting on a set of 14” Magnum 500 Wheels with BF Goodrich White Letter tires. On the inside, it's done in the Green to complement the exterior. New seat covers and door panels were installed. It has bucket seats with the T handle shifter. Looking at the dash it all appears stock with the factory gauges with working speedo and gas gauge. The oil pressure, temp and amp gauges are also working. This Mustang has the top boot for when the top is down. Under the hood it's all painted correct with the black inner fenders and firewall. The power comes from the 289 that's set up with a Four Barrel Intake and Edelbrock Carb. It's dressed in chrome valve covers and breather. The engine is mated to the C4 Automatic Trans and the 8” Rear End. This Mustang does have Power Brakes with Disc on the front and drums on the rear. When you look under it the floors have been patched and they did a great job on it. 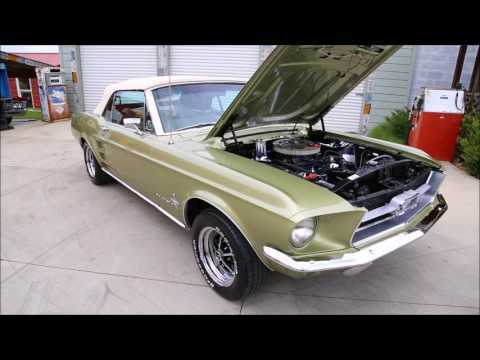 In 1967, the Mustang saw its first redesign since the original. The overall concept: bigger. Even as the original version continued to see success on the sales floor, the Mustang's designer Lee Iacocca was overseeing the redesign for a larger version. Essentially, this larger version would allow for installation of a big-block V8 engine, but the interior and cargo space also increased. Exterior trim changes included concave tail-lights, side scoop side ornamentation, square rear-view mirrors, and usual yearly wheel and gas cap changes. The high-performance 289 option was placed behind the newer 335 hp (250 kW; 340 PS) 390 cu in (6.4 L) FE engine from the Ford Thunderbird, which was equipped with a four-barrel carburetor. The 1967 Deluxe Interior was redesigned to exclude the embossed horses on the seats and instead feature special color options, brushed aluminum or woodgrain dash trim, seat buttons, and door panels. The 1967 hardtop also had the chrome quarter trim caps, carried over from 1965-66. The 1967 deluxe interior included stainless steel-trimmed seat back shells, similar to those in the Thunderbird. These were dropped at the end of the 1967 model year. At the time, many car enthusiasts thought the '67 Mustang was too big and heavy, but it's among the most popular vintage cars today.